This past Sunday, a couple friends and I went to this little bistro on 7th avenue between 23rd and 22nd street. Brunch is a MUST on Sundays which means it can be a challenge to get a seat. However this was not the case for Highpoint. Not only did we get seated right away but we were able to sit outside! 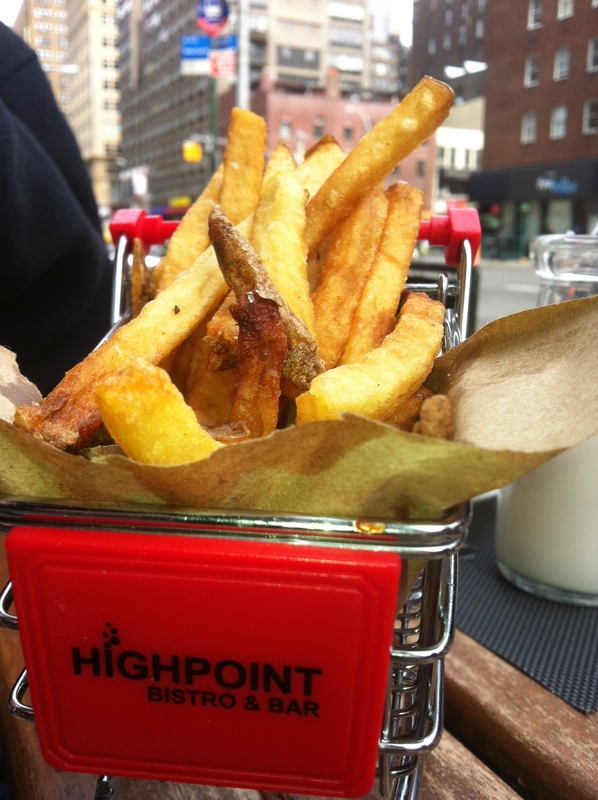 Highpoint doesn’t advertise offering gluten free food, however, there are a few items on the menu you can get. It’s important you let the server know you’re gluten free and ask which items on the menu you can have ‘as-is’ or can modify. Fun Fact: Joe Jonas, one of the Jonas brothers, often stops here for a bite. AND while I was eating I noticed Jeremy Wade from River Monsters was sitting two tables from me! Yes I LOVE River Monsters. So if you are ever looking to “accidentally” bump into Joe Jonas or Jeremy Wade you know where to go! Highpoint offers really good drink specials like $5 Bloody Marys (pic below) and they made us amazing Irish Coffee which was delicious! 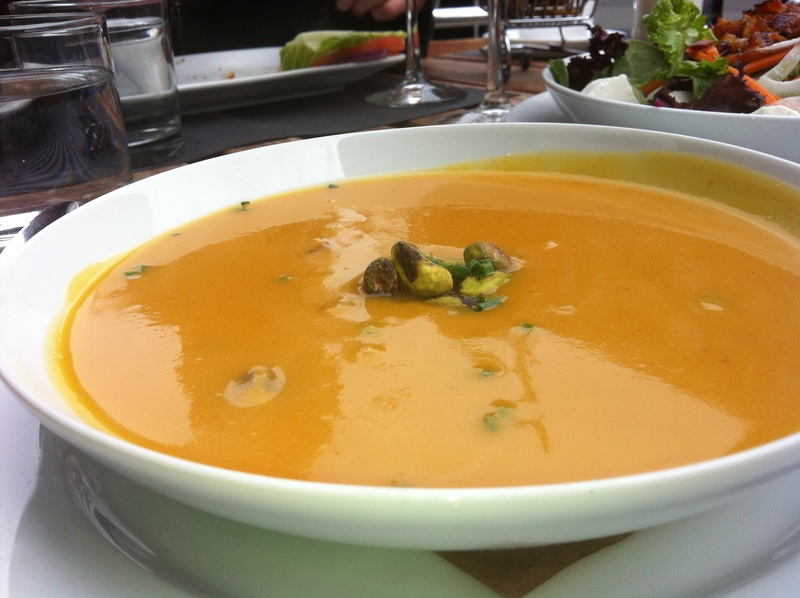 Squash soup with pistachios and small bits of roasted apple for $8. This soup was awesome. I honestly wanted to order more but who seriously wants to carry soup on the subway back to their apartment… not this girl. Farmers salad with mesclun greens, bacon, goat cheese, shredded carrot, fennel, pepitas, shallot vinaigrette (I replaced with EVOO on the side) for a total of $9. I was pleasantly surprised with this salad. All the ingredients were well portioned and fresh; living it up its ‘farmers’ name. Overall, the service, food and drinks were great. I would definitely eat here again! If you have any questions or comments send em’ over! I’d love to know your thoughts of the food if you’ve eaten here. 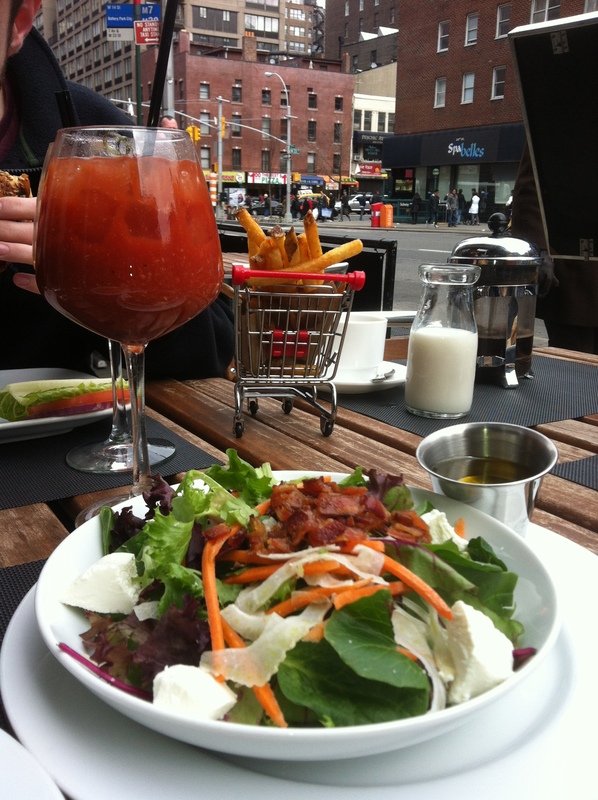 Click here to check out the Brunch Menu. Next time I visit NYC I would love to try this place looks and sounds delicious!!! Thanks for the comment! If you go to Highpoint please let me know how it is and feel free to share any pics 🙂 If you’re looking for any other Gluten Free suggestions in NYC I have a ton more!